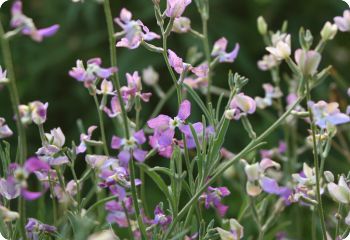 Night Scented Stock is grown for its sweetly fragrant blooms. The small, lilac flowers are not showy, so they are traditionally hidden amongst other flowers to add fragrance to the garden. Try Night Scented Stock with Virginia Stock for extra color and fragrance. They are both heirloom flowers. Also known as Evening Stock or Matthiola bicornis. Easy to grow in a wide range of conditions. Sow Night Scented Stock seeds outdoors in mid spring. Barely cover the seeds with soil. Full sun.